Roses represent different types of love, including romantic. 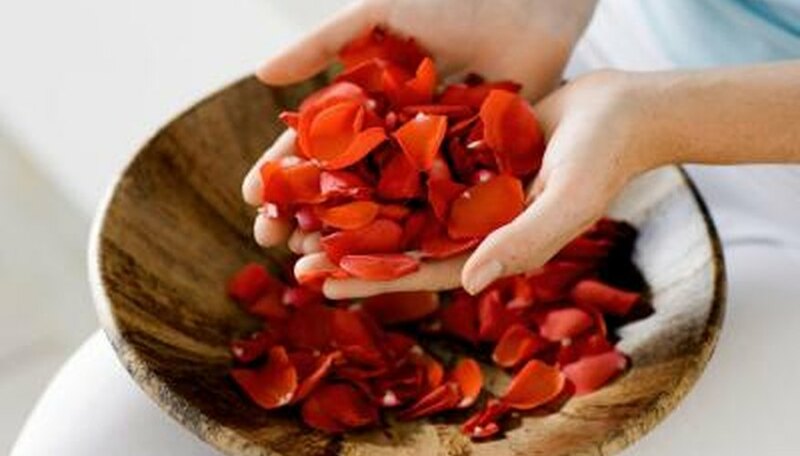 A trail of soft pink rose petals will make good clues to lead your loved one to a tryst. Strew petals on the porch to greet him and display a small card that gives instructions. Put cards along the path of petals weaving through the house. Cards could say, “Leave tie here” or “Go to your left.” You could be the prize of this sensual treasure hunt. Throughout the day, text three clues to your sweetheart about your location. Pick a romantic dinner spot where you could have a nice getaway. Choose a place that has several words in the name. Give clues for each word as the day progresses. As a courtesy, tell your partner what you plan to do at the beginning of the day so she will understand how to play. Buy three decorative glass bottles with stoppers. Tuck a clue in two of the bottles and a key in one. The clues should be simple riddles you have written on a scroll, rolled up and secured with ribbon. The first clue should shed light on the location of the key. The second clue should lead the way to the treasure chest. Fill your treasure chest with items to use on a romantic date such as chocolates, a small bottle of wine and massage oils. The clues should point to the key and chest. Unlock the chest with the key. Buy a puzzle that features a romantic picture when all the pieces are put together. If this is a clue to a romantic beach destination, choose a puzzle with a beach on it. If it is for a dreamy boat ride, choose a puzzle that pictures a boat. Put the puzzle together upside-down. With a marker, write a clue or hidden message on the back of the puzzle. Take the puzzle apart and put the pieces back in the box. Wrap it up and offer it to your lover. She will be thrilled to discover the upside-down puzzle leading her to your date. Patrick, Monica. "Ideas & Clues for a Romantic Treasure Hunt." Dating Tips - Match.com, https://datingtips.match.com/ideas-clues-romantic-treasure-hunt-5859301.html. Accessed 23 April 2019.